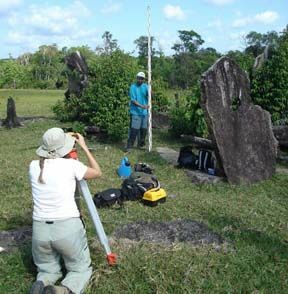 Calçoene, a small coastal town in a remote region of northern Brazil, 240 miles north of Macapá, the capital of Amapá State, preserves what experts call “the Brazilian Stonehenge,” In this megalithic site called AP-CA-18 archaeologists have recently found huge granite rocks standing vertically in circular formation, some of which were sculptured and perforated to align with solstices and equinoxes, evidences that suggest the site has already been used as an astronomical observatory. Like many other megalithic sites throughout the world the massive stones were brought from afar since no stones can be found nearby. The first excavations revealed a series of pottery fragments and even whole pots presumably from the Aruak indigenous nation of the Orinoco River, northern Amazon, considered one of the most sophisticated cultures in the rain forest. A series of other sites are believed to exist throughout the region which could change the whole history of the settlement in the Amazon. Ongoing researches are been carried out by IEPA (Technological and Scientific Research Institute of Amapá State). The AFFS in Brazil has met the chief archaeologists in the excavations, Mariana Petry Cabral and João Darcy de Moura Saldanha, and plans new visits for new studies at the site.